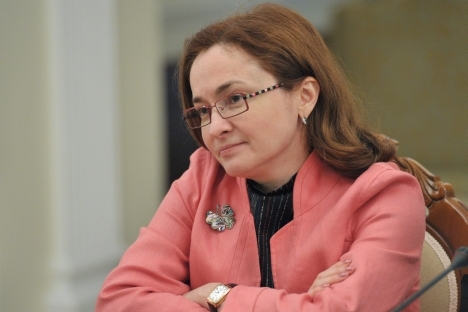 Elvira Nabiullina will probably increase Kremlin control over the regulator, but have to balance conflicting demands for looser monetary policy and lower inflation. While President Vladimir Putin’s nomination of Elvira Nabiullina, a former economy minister, as Russia’s new Central Bank chief, has been hailed as a sign of continuity, it is also further evidence of his concern about flagging economic growth and is likely to see the regulator more closely aligning its fiscal policy with the Kremlin’s. Economists, financial experts and leading politicians welcomed the appointment of Nabuillina, widely seen as a formality after her nomination by Putin on March 12, seeing strong positives in her track record on liberal reforms and her close position to Putin. Nabiullina, who served as Economic Development Minister from 2007 to 2012 and shepherded Russia through its accession to the World Trade Organization, became an economic adviser to Putin after his return to the presidency last year. The outgoing Central Bank chairman, Sergei Ignatiev, is expected to be asked to stay on as an adviser to Nabiullina, suggesting that a degree of continuity in monetary policy may well be maintained. Yet Nabiullina, who will become the first female Central Bank chief both from Russia and throughout the G8, comes to the post at a difficult time. Putin’s administration is grappling with the twin challenges of trying to boost flagging growth, while trying to curb growing inflation. Russia’s growth, at 3.2 percent in 2012, is currently the weakest since 2009, and year-on-year inflation in February, at 7.3 percent, is the highest in 18 months. While oil prices, which fueled spectacular Russian growth in the years before the 2008-09 world economic crisis, have remained high, they have merely protected the Russian economy from the worst aspects of global recession in the years since. Also, the appointment of a politician, rather than a banking insider, to the post is raising questions about whether the Central Bank will be able to maintain the level of independence displayed under Ignatiyev, who has resisted calls for a looser fiscal policy and higher government spending. Leading Russian officials, such as First Deputy Prime Minister Igor Shuvalov, have called for the Central Bank to cut interest rates as a way to boost credit flows and boost growth, a call that was underpinned by Putin in recent weeks. But some economists say that such measures would probably only have a limited effect in boosting growth. Nabiullina’s appointment was welcomed by former Finance Minister Alexei Kudrin, indicating widespread support for her skills across the political spectrum among Russia’s elite. "I believe this is a good candidacy, and I am sure she will be able to do the job,” Kudrin told reporters on the sidelines of the Russia Business Week forum in London on Thursday. “I believe she is among those most deserving this position." The comments by Kudrin, who was one possible candidate for the Central Bank job but is thought likely to be setting his sights on the prime minister’s post instead, could indicate a strong willingness to work together with Nabiullina in the future. Prime Minister Dmitry Medvedev has come under fire in recent months over slowing economic growth, and experts see a return by Kudrin, who was fired as Finance Minister by Medvedev in September 2011 over spending disagreements, as one option if Medvedev is replaced by Putin. While Nabiullina’s appointment is being seen by some Western experts as indicating stronger Kremlin control over the Central Bank, in the Russian context that may not necessarily be the case. Throughout his time as president and prime minister, Putin has traditionally balanced strongly contrasting advice from liberal economic aides with demands from other officials and ministers for higher government spending, and any mainstream candidate for Central Bank chief was, it could be argued, always going to come from Putin’s inner circle. Thus Nabiullina’s new role may entail mediation between the two sides of the “spending vs. austerity” argument, rather than the ascendancy of one over the other. Whether Nabiullina’s appointment itself signifies a greater focus on growth-oriented policies, or merely continues a trend under her predecessor is unclear. But experts see a clear need for the government to address growth concerns urgently, by cutting interest rates as soon as a fall in inflation allows. Much will depend on the state of the Russian and global economy by the time Nabiullina takes charge on June 24 – at the time of the St. Petersburg International Economic Forum. Sluggish economic growth will increase the pressure for a cut in interest rates, but inflationary pressures and a further downturn in the global economy may severely restrict her room for maneuver.